The fair is incomparable to any other event in the area. This isn’t just Jacksonville’s offering to the annual fairs that roll through every county, this is The Greater Jacksonville Agricultural Fair. It’s greater, in that it dwarfs any of the other county fairs in both size and extent. I’m not sure precisely how it compares in size to other fairs, but it is the biggest I’ve ever attended. Of course, that perception is relative too. Because in Hoboken or Minneapolis, an agricultural fair may not be that big of a deal, but in the Deep South, a fair is part of our folk history. In fact this one has been around longer than anyone reading this, I would dare bet. Of course there are the spectacles that everyone goes there for, the rides that spin and teeter and rise far above the earth. Few things can give you that anxious and excited feeling that rides at the fair provide. People that adore the scariest roller coasters and travel the country to try the rides are still scared of the fair rides, and therein lays precisely their thrill. They are thoroughly inspected and tested on hapless, toothless carnies before you are allowed to get on board, but the knowledge that it is at least slightly more likely for these road-weary portable machines to jeopardize your life than it is a permanent fixture at a theme park provides a portion of that thrill. Real terror. Couple that with Iron Maiden blaring through the speaker and the cryptic look in the eyes of the man controlling your fate with a lever, and you have a perfect autumn scare. In the midway you can test your skills against the taunting carnies and win your sweetheart a framed velvet portrait of the Guns N’ Roses logo or a 80% likeness Winnie the Pooh doll for your sweetheart, or dare to try one of the many other spectacular spectacles along the walk around the fair. 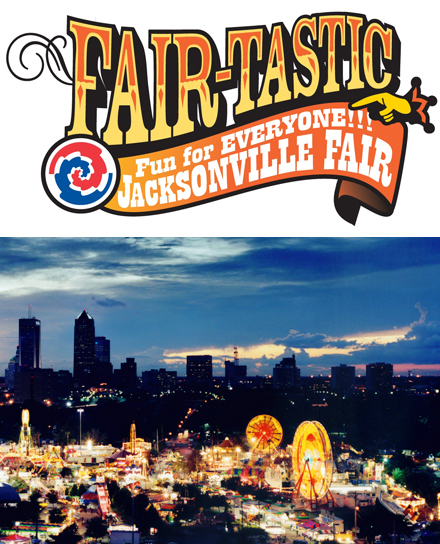 Whether you want to get upside down or just see the county’s finest hog, the Greater Jacksonville Agricultural Fair has plenty to offer for all ages and is a true cultural experience. Read on for details about the shows and the exhibitions (not to mention the food). Admission tickets may be purchased on-line at any time before and during the Fair or at the gate. Ride tickets are available, and different rides require different numbers of tickets, but wristbands for unlimited rides usually cost between $20 and $25 dollars depending on the day. Go to JacksonvilleFair.Com for more details. Posted on October 31, 2012, in Life In The Fab Lane and tagged Florida, Jacksonville, mile marker, road trip, The Greater Jacksonville Fair, travel, vacation. Bookmark the permalink. Leave a comment.